image: Within the shape of a large black letter ‘U’ emerge the head and shoulders of a U-boat commander, identified by his cap and jacket, who peers into the sights of a periscope toward the right of the poster. Beneath and beyond the ‘U’ shape are grey waves. On the horizon is the dark outline of a ship, broken in two and sinking, a cloud of white smoke rising from the wreck. Behind it can be traced the pale outline of another vessel. text: U BOOTE HERAUS! [The U-boats are out!] H R ERDT. Hollerbaum & Schmidt, Berlin. 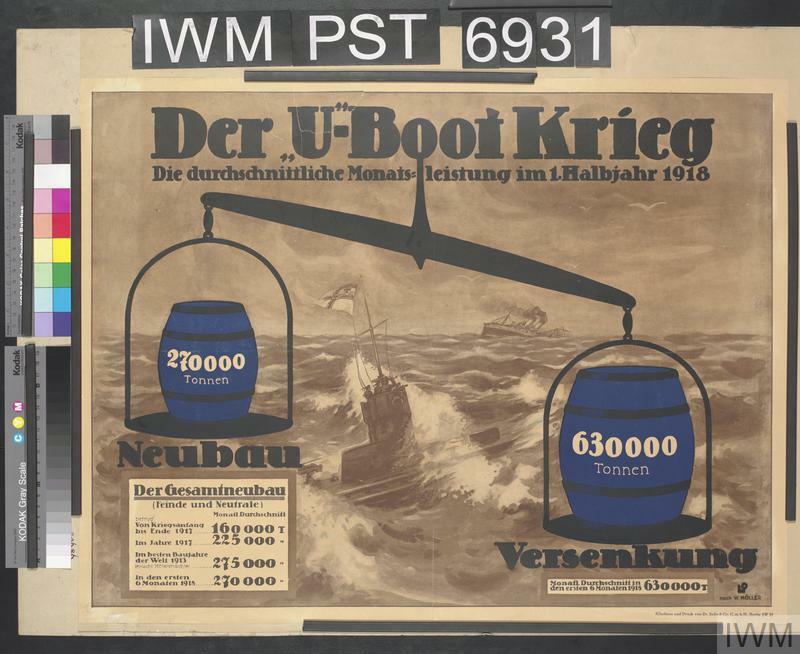 This German film poster publicises a version of the first U-boat propaganda film released by Bufa (Königliche Bild- und Film-Amt) early in 1917. 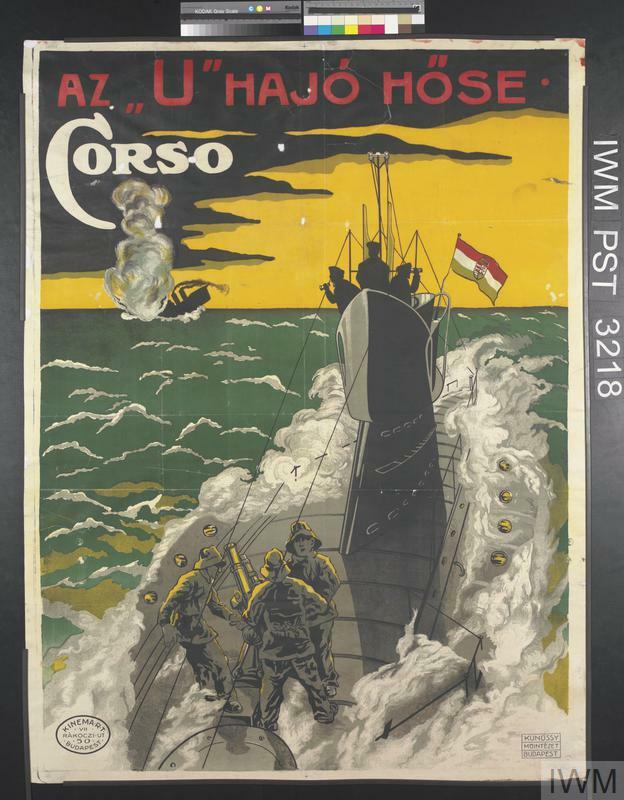 Widespread stories of the exploits of the auxiliary cruiser/commerce raider ‘Möwe’ had alerted the German public to the abilities of this new marine technology. Erdt’s poster design offers the U-boat commander as a new kind of hero who is in control of his vessel and of the battle, manipulating events from a hidden underwater perspective. In fact, the majority of confrontations occurred when the submarine was on the surface. Submarine technology was not advanced and the vessels could not stay underwater for long periods. This and the shorter version of the film (‘Ein Besuch bei unseren Blaujacken’) paved the way for the extraordinary film ‘Der magische Gürtel’, promoting the effectiveness of submarine warfare to both the German public and to audiences in friendly and neutral countries. Hans Rudi Erdt designed a number of film posters for Bufa which exhibit a confident graphic expertise. In common with German poster designers of the period he combines hand-drawn lettering and bold areas of flat colour, integrating image and text into one message. 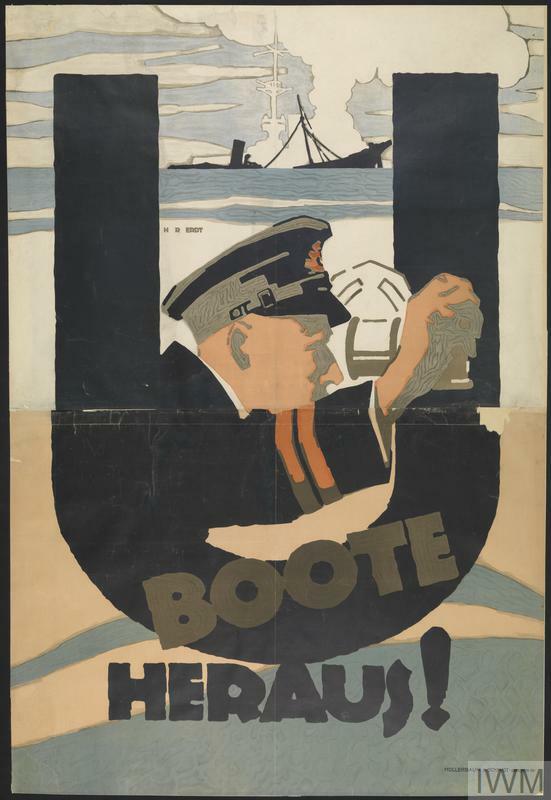 This particular poster, where the ‘U’ is both part of the text and fundamental to the design, is an elegant example of his work.